The Beauty Junkie - ranechin.com: Puteri Harbour Attractions Welcomes Families and Children for a Family Fun Weekend! 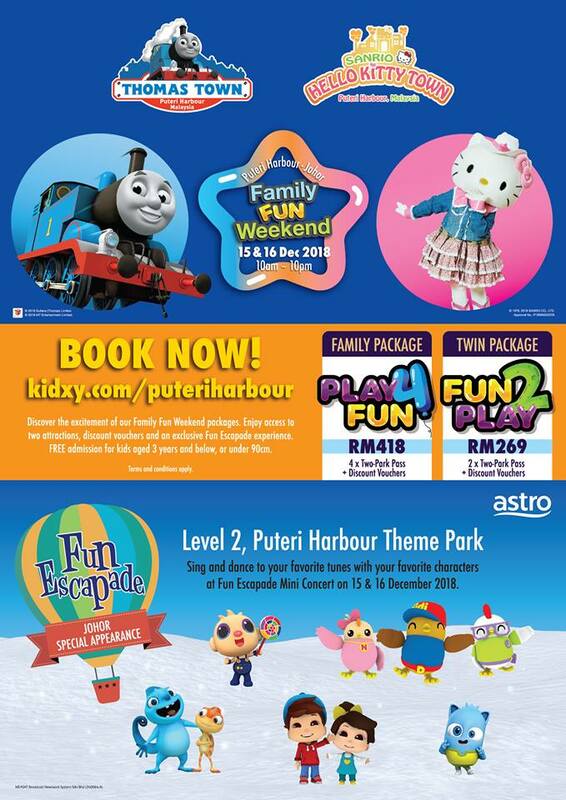 Puteri Harbour Attractions Welcomes Families and Children for a Family Fun Weekend! The long awaited year-end school holidays is here! I bet all the kids can't wait to visit to fun places with their parents, family and friends. Why not pack your bags and head over to Puteri Harbour Attractions, who plays host to Astro’s first-ever Fun Escapade event outside of the Klang Valley! This much-anticipated annual family event features two whole days of jam-packed concerts and meet-and-greet sessions with beloved characters such as Didi & Friends, Omar & Hana and Cam & Leon among others, as well as games for the whole family on Saturday and Sunday, 15 and 16 December 2018 at SANRIO HELLO KITTY TOWN and THOMAS TOWN! Alternatively, tickets can also be purchased at Puteri Harbour on the day of the event. For more information, please visit www.kidxy.com/puteriharbour or call 1 300 88 FAMILY (326459).